First I'm going to tell you the inventor of the optical mouse. The first optical mouse was made by Agilent Technologies. The first amazing thing in optical mouse is that it can work almost any surface. The two basic things it carries is red LED and CMOS sensor. Let's see how these two things work. LED>>it emits light that bounces off the surface onto a complementary metal oxide semiconductor. CMOS>> it is very efficient, it sends each image to digital signal processor (DSP) for analysis. Laser based mouse is even better than simple led mouse it can handle more details than comparable LED mouse easily. 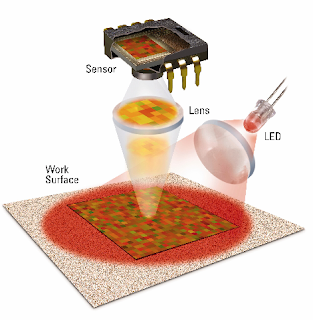 CMOS sensor sends each senior to DSP. DSP detects each image pattern and compare it to the previous patterns to analyze how the pattern have moved since the previous one. Through changing pattern the DSP determines how far the mouse has moved and send the respective coordinates to the computer. The computer changes the mouse position through this data ( coordinates ) received by computer via mouse. Now you gonna understand why I said very efficient. It passes hundreds of times each sect. Magi the cursor appear to move smoothly. The mouse sends thousands of images per second to the computer. It has several benefits over a trackball mouse. Unlike trackball mouse it has no moving parts, so it causes less chance of failure. There is no opening for dust to come in. And interfere at the tracking sensor. Increased tracker resolution is directly proportional to smoother response. They don't require a special surface unlike trackball mouse. Their accuracy depends upon their resolution value which is termed as DPI (DOTS PER POINT) value. Higher the DPI greater the resolution so greater the sensitivity of the mouse. Less you need to move to obtain reponse. Most mice have sensitivity about 400x 800 dpi. But gaming mouse are of a special kind and have a density of 1600 dpi. Some moms even have the choice to adjust its density, depend on the game type. DON'T FORGET TO COMMENT AND SHARE.HIT THE LIKE BUTTON.